Encourage your friends and colleagues to help landmine survivors rebuild their lives–ask them to join our online community. Thank you! Items with a red asterisk (*) are required fields. Join Landmine Survivors Network's Online Community! Message: Hello! This is an invitation to join Landmine Survivors Network's online community. Landmine Survivors Network is an organization dedicated to helping landmine victims around the world. We help the injured in war-torn countries pick up the pieces and rebuild their lives. We are proving that with the right support everyone can recover and thrive. By joining our online community, you will stay informed about our work, key developments in our Networks, and most importantly, about the innocent victims we are helping daily. 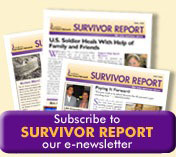 On our web site, you'll find unbelievable stories of survival. You'll also have the opportunity to make a real difference in survivors' lives by making a secure online donation. Please join us. Sign up today!